The biceps muscle is located in the front of the upper arm (humerus), and is used when lifting, bending the elbow, and reaching up over the head. The upper portion of the biceps muscle attaches to the front of the shoulder in two places, and the lower portion attaches to a bone in the forearm. Lifting, pulling, reaching, or throwing repeatedly can lead to biceps tendinopathy or even tears of the upper biceps tendon. Biceps tendonitis is an inflammation or irritation of the upper biceps tendon. 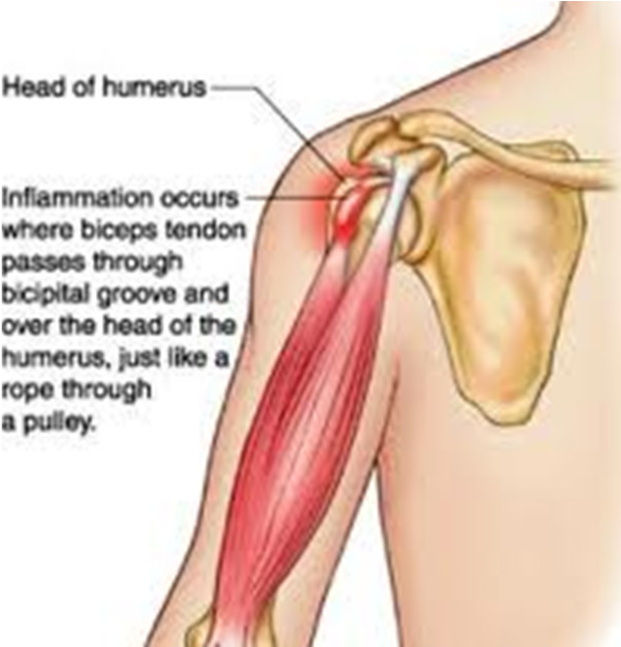 Years of shoulder wear and tear can cause the biceps tendon to become inflamed. Examination of the tissues in these cases commonly shows signs of degeneration. Degeneration in a tendon causes a loss of the normal arrangement of the collagen fibres that join together to form the tendon. Some of the individual strands of the tendon become jumbled due to the degeneration, other fibres break, and the tendon loses strength. When this happens in the biceps tendon, inflammation, or even a rupture of the biceps tendon, may occur. 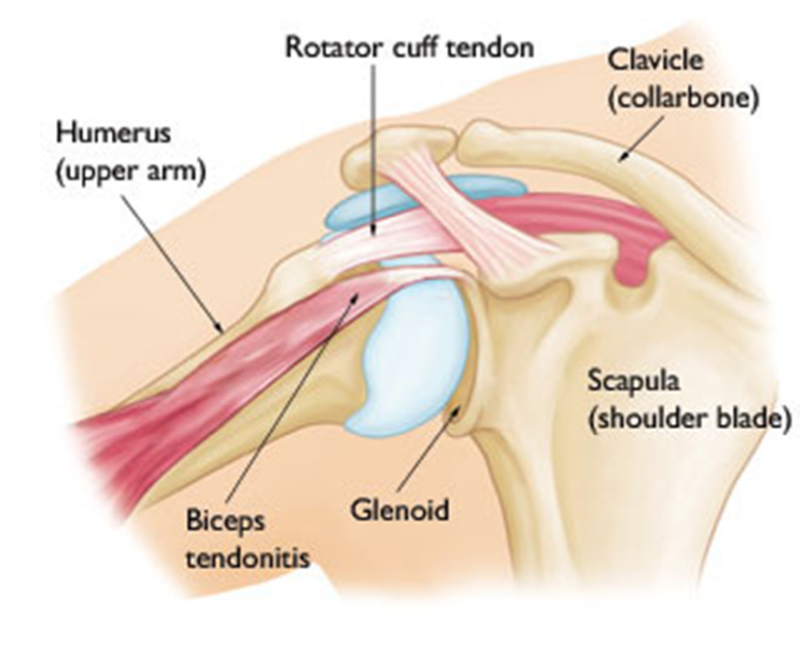 Biceps tendonitis can happen from a direct injury, such as a fall onto the top of the shoulder. A torn transverse humeral ligament can also lead to biceps tendonitis. If this ligament is torn, the biceps tendon is free to jump or slip out of its groove, irritating and eventually inflaming the biceps tendon. What are the typical symptoms of Biceps Tendinitis? Your doctor will first take a detailed medical history and perform a physical examination of your shoulder. Special tests are done to see if nearby structures are causing problems, such as a tear in the labrum or in the transverse humeral ligament. The doctor checks the shoulder for impingement, instability, or rotator cuff problems. An x-ray may show if there are bone spurs or calcium deposits near the tendon. X-rays can also show if there are other problems, such as a fracture. Plain X-rays do not show soft tissues like tendons and will not show a biceps tendonitis. Magnetic resonance imaging (MRI) scan may be ordered and this can show if there are problems in the rotator cuff or labrum. However an MRI is not usually needed to confirm diagnosis. Generally nonsurgical options are the first consideration. Rest and Ice – The first step toward recovery is to avoid overhead activity. Apply cold packs for 20 minutes at a time, several times a day, to keep swelling down. Non-steroidal anti-inflammatory medications – Drugs like ibuprofen and naproxen reduce pain and swelling. Steroid injections – Steroids, like cortisone, are very effective anti-inflammatory medicines. Injecting steroids into the tendon can relieve pain. Your doctor will use these cautiously. In rare circumstances, steroid injections can further weaken the already injured tendon, causing it to tear. Physiotherapy – Specific stretching and strengthening exercises will restore range of motion and strengthen your shoulder. Patients who are improving with conservative treatments do not typically require surgery. Surgery may be recommended if the problem continues or when there are other shoulder problems present. The most common surgery for biceps tendonitis is acromioplasty, especially when the underlying problem is shoulder impingement. This procedure involves removing the front portion of the acromion, the bony ledge formed where the scapula meets the top of the shoulder joint. By removing a small portion of the acromion, or shaving the undersurface of the acromion to remove any bone spurs, more space is created between the acromion and the humeral head. This takes pressure off the soft tissues in between, including the biceps tendon. This procedure is usually done using an arthroscope. The surgeon inspects the rotator cuff muscle to see if any tears are present. The entire area is irrigated to flush away small particles of bone. 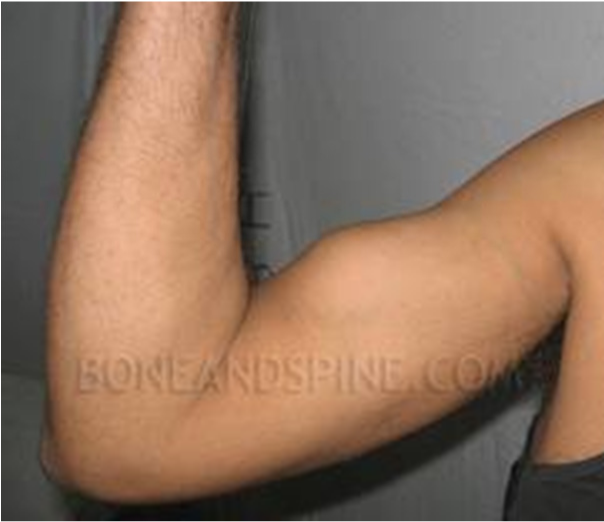 If the biceps tendon is severely degenerated, the surgeon may perform biceps tenodesis. Biceps tenodesis is a method by which the damaged section of the biceps tendon is removed and the new top end of the tendon is reattached to a new location on the upper arm bone (humerus). Removing the painful part of the biceps usually resolves symptoms and restores normal function. Depending on your situation, your surgeon may choose to do this procedure arthroscopically or through an open incision. In severe cases, the long head of the biceps tendon may be so damaged that it is not possible to repair it or perform a tenodesis. Your surgeon may elect to release the damaged biceps tendon from its attachment. This is called a biceps tenotomy. This option is the least invasive, but may result in a ‘Popeye’ bulge in the arm (pictured right). What is involved in rehabilitation? You should have immediate use of your hand for daily activities – writing, using a computer, eating, or washing. Your doctor may restrict certain activities to allow the repaired tendon to heal. It is important to follow your doctor’s directions after surgery to avoid damage to your repaired biceps. Your doctor will soon start you on therapeutic exercises. Flexibility exercises will improve range of motion in your shoulder. Exercises to strengthen your shoulder will gradually be added to your rehabilitation plan. It generally takes four to six months, however, to safely begin doing forceful biceps activity after surgery. Most patients have good results. They typically regain full range of motion and are able to move their arms without pain. People who play very high-demand overhead sports occasionally need to limit these activities after surgery.